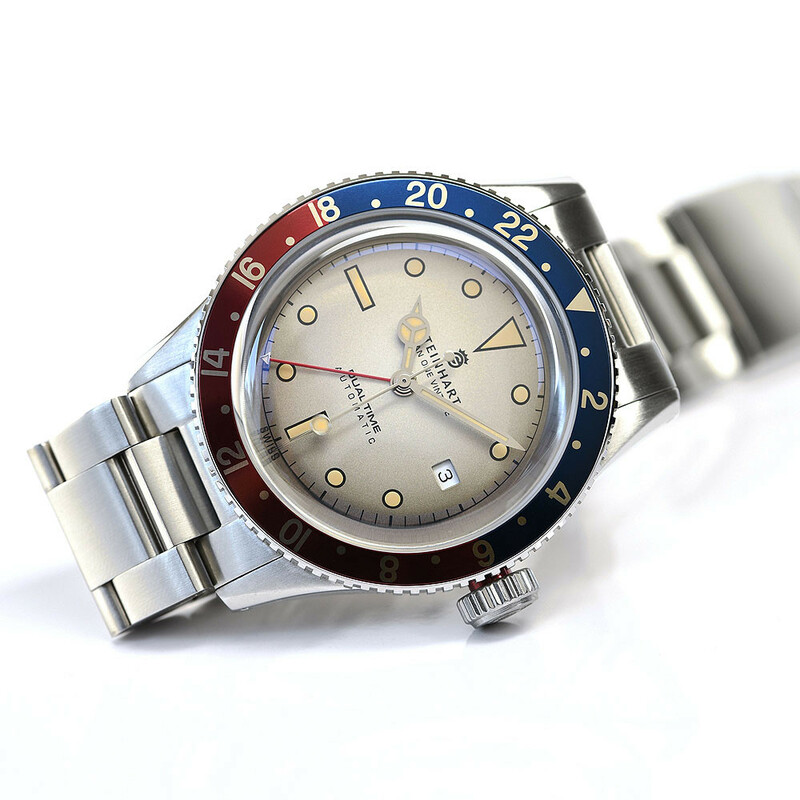 In the mid-1950s the major civilian airlines were increasingly offering transatlantic flights, which created for the pilots the need for a wristwatch that was able to show a second time in addition to the regular one, individually adjustable, to display two different time zones at a single glance. 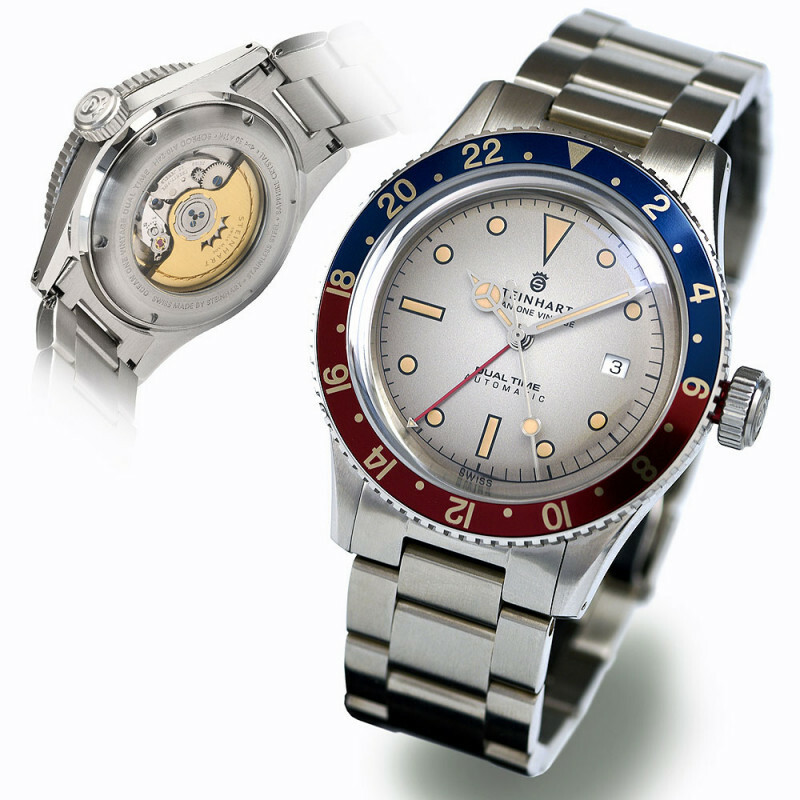 So a wristwatch was developed in Switzerland in 1954 that enjoys to this day both in the civil and military aviation great popularity. 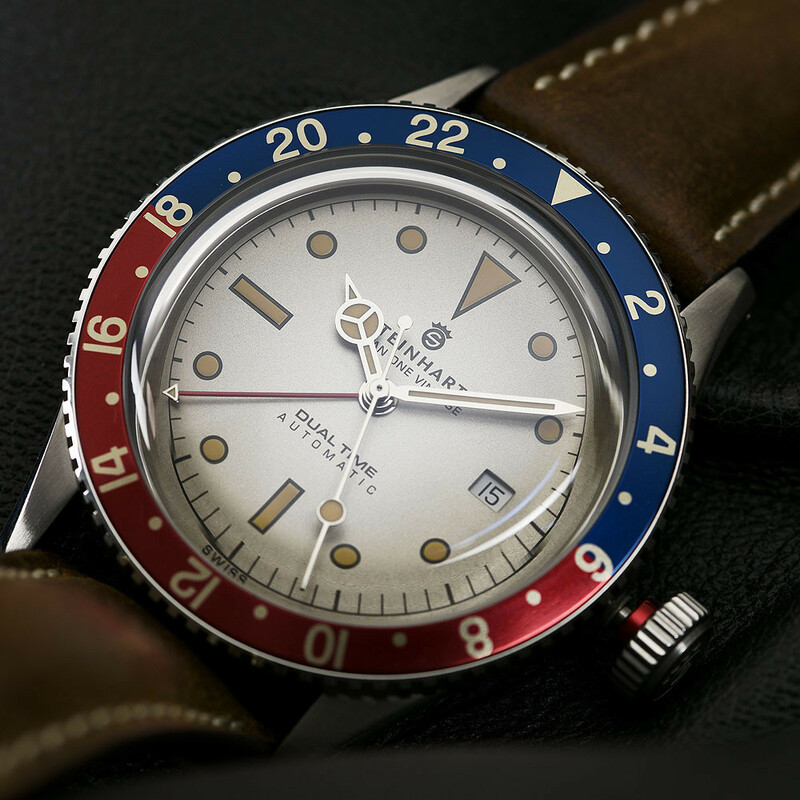 To pay tribute to this extraordinary time, we have designed the STEINHART Ocean One Vintage Dual Time PREMIUM a compact wristwatch featuring a second time zone (dual time) and a date complication, which displays the even days in red colour and the odd days in black. 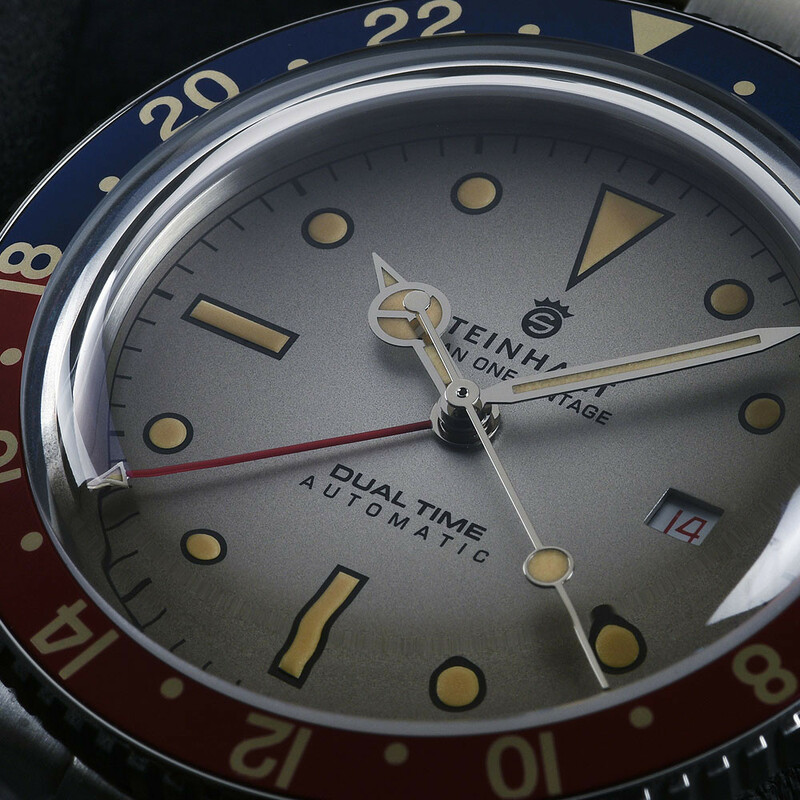 The first thing that catches the eye is the extraordinary dial, whose multiple facets are nearly impossible to capture in a photo. 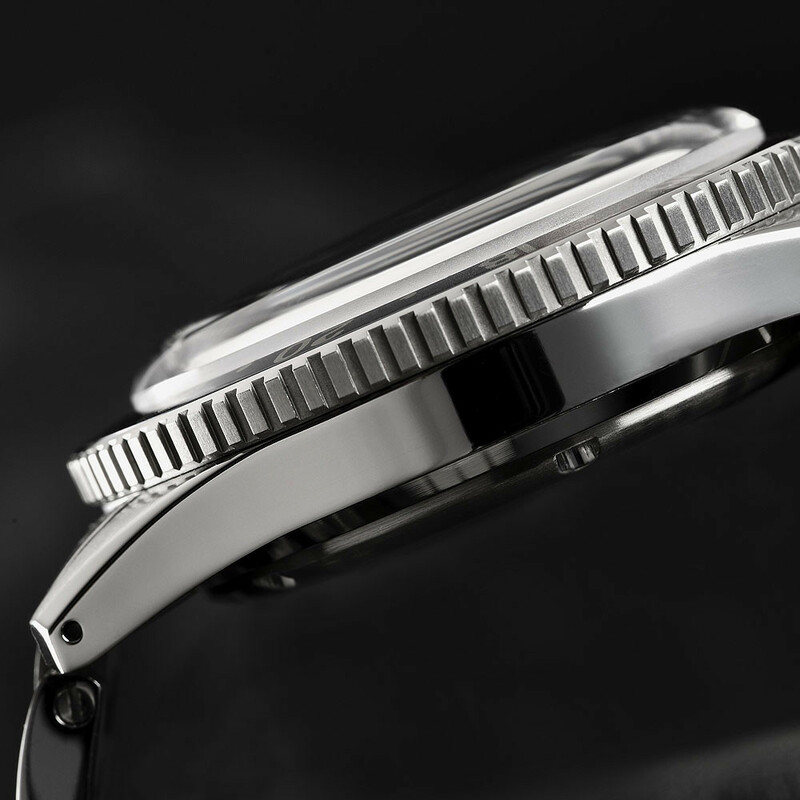 The silvery shiny, gray-beige tone is additionally superimposed by a radial gradient, which extends from light to darker from the center outwards to the edge of the dial, underlining magnificently the vintage character of this extraordinary watch. 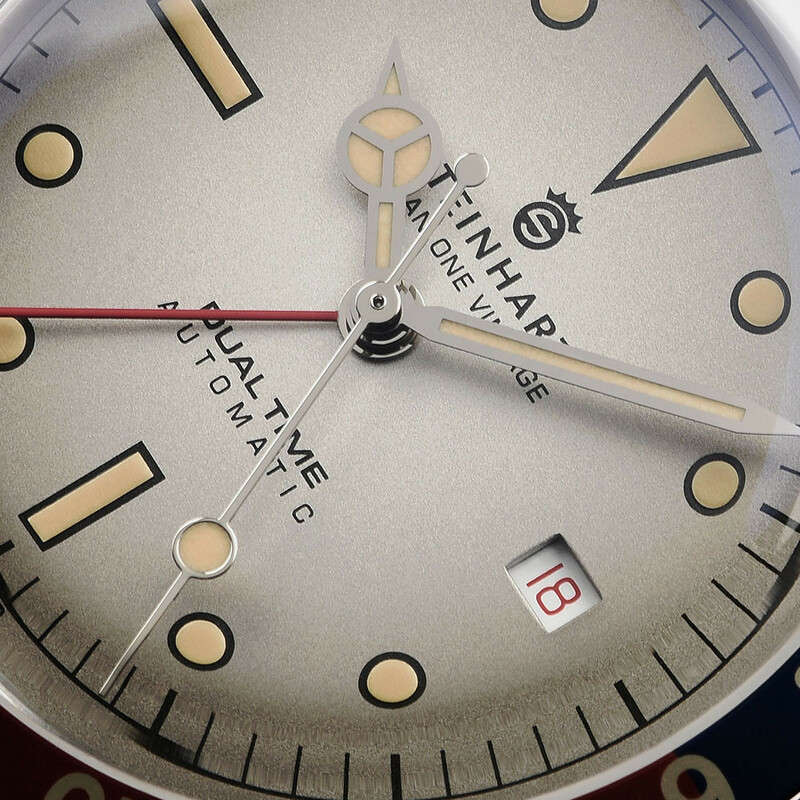 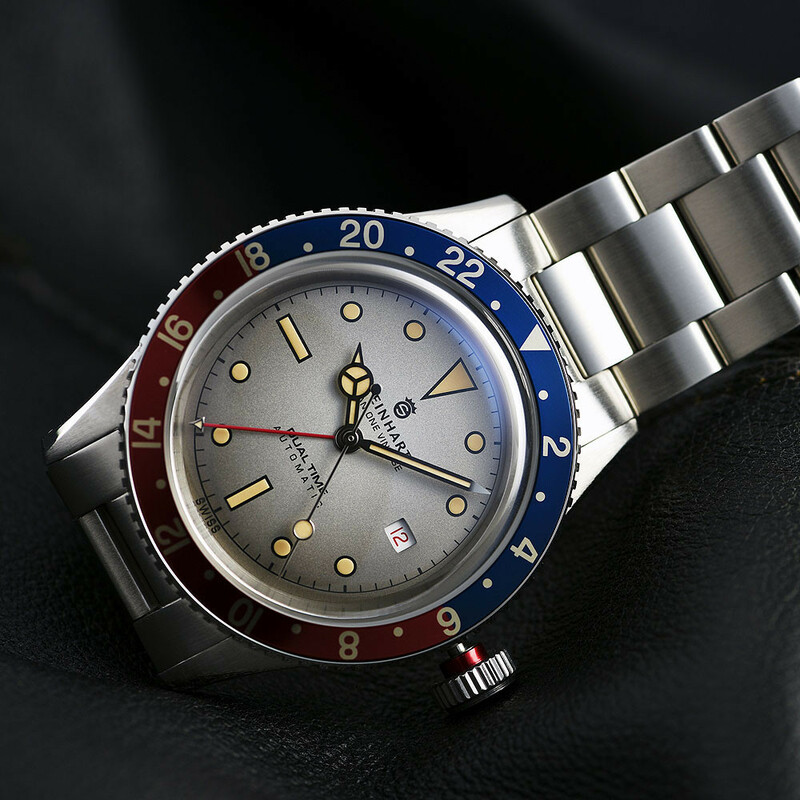 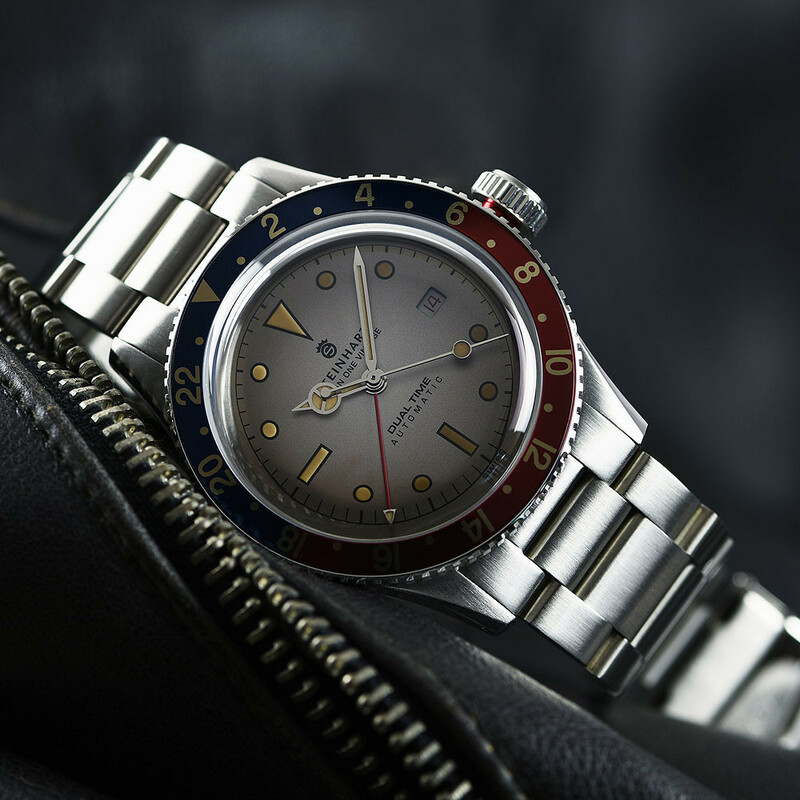 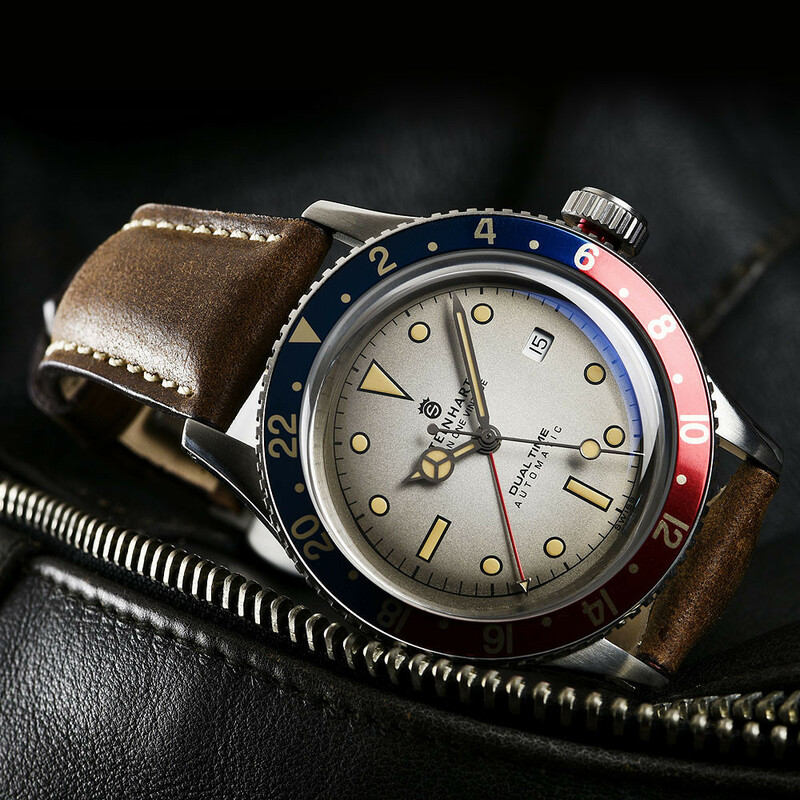 The markers and hands are lavishly equipped with luminous colour which, with its natural ecru tone, mimics the appearance of aged radium, or tritium, once again citing the historic character of the STEINHART Ocean One Vintage Dual Time PREMIUM The second time zone can be adjusted individually by either the fourth hand, painted in red with a small arrowhead, as well as by setting the unidirectional rotating bezel, which features a two-tone aluminum inlay with 24-hour scale. 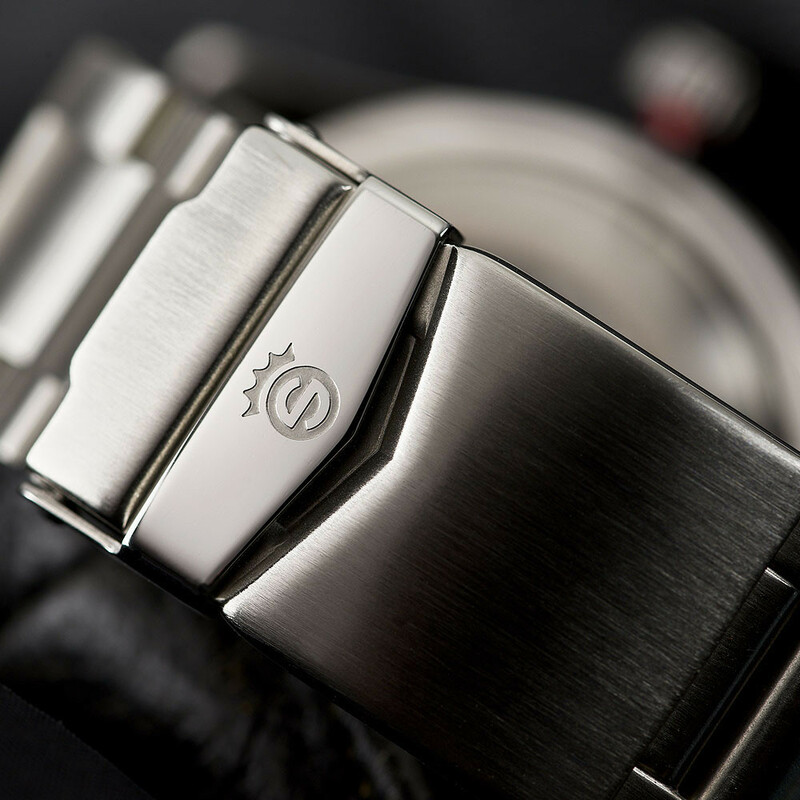 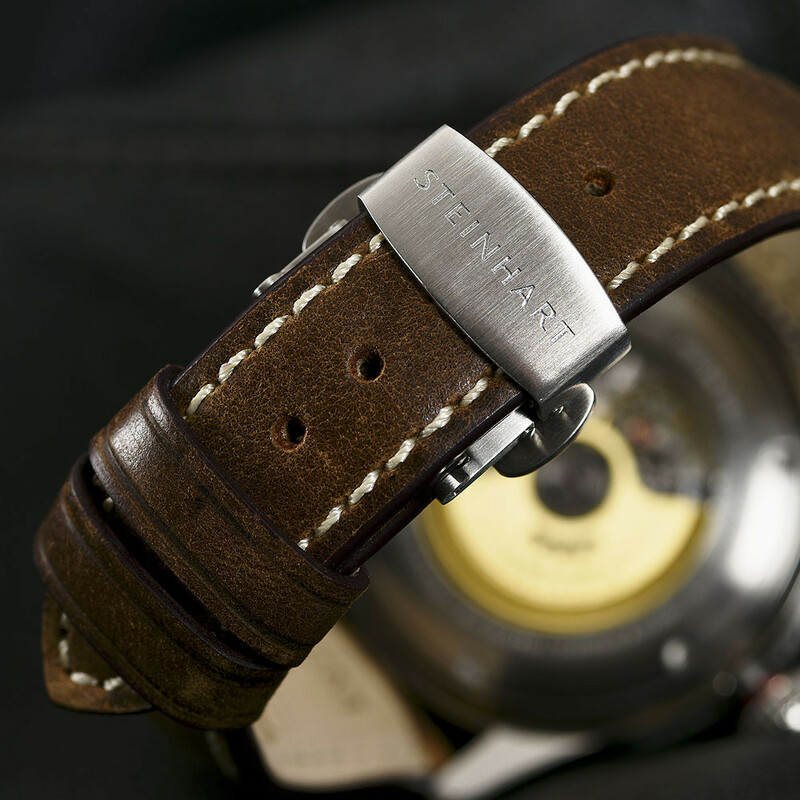 All four hands as well as the two-tone date are driven by an ETA 2893-2 Premium movement. 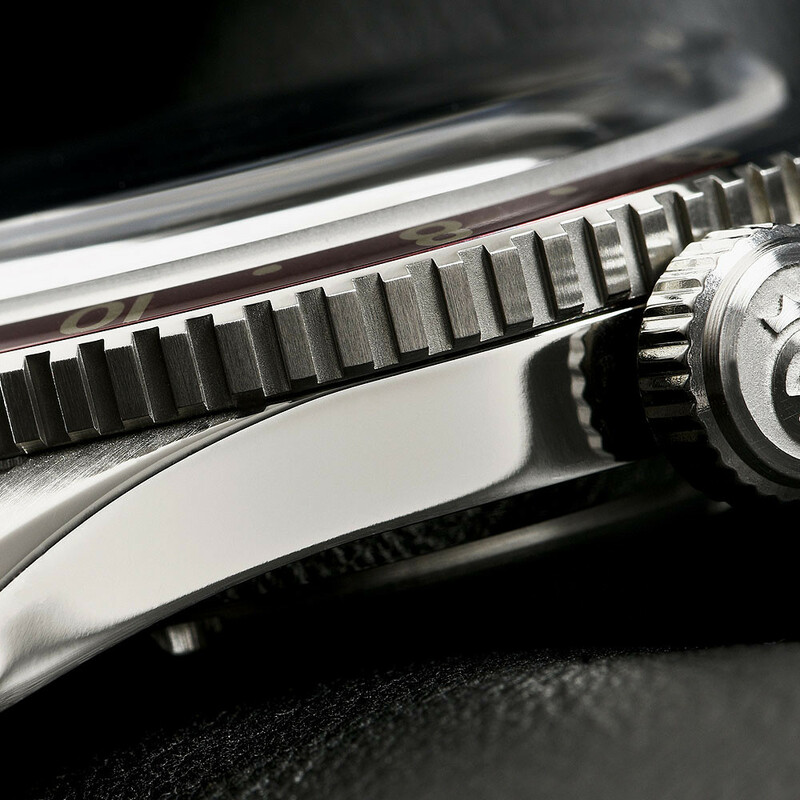 It impresses with a lush and detailed decoration, which is additionally crowned with the skeletonized, gilt STEINHART rotor. 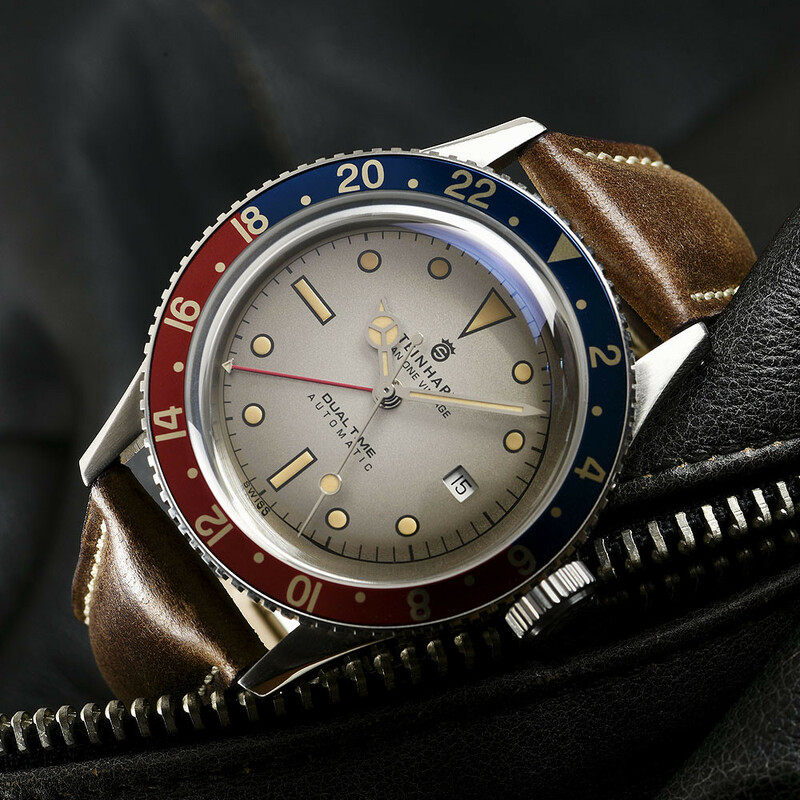 It goes without saying that so much beauty should not be hidden under a solid steel case back and so this masterpiece of precision can be admired through the glass of an exhibition case back. 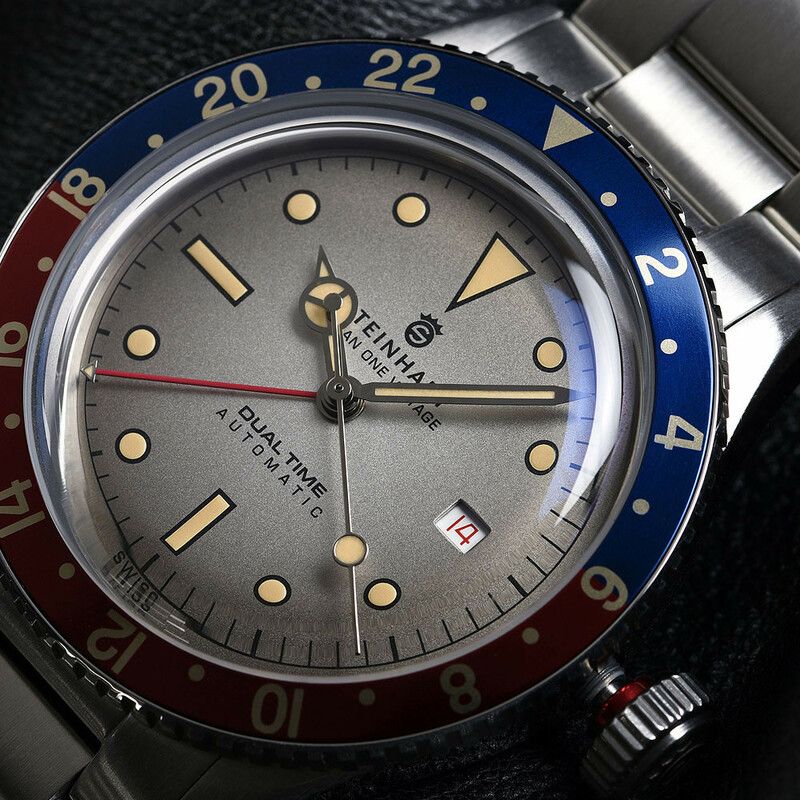 And if that were not enough to make the heart of every collector beat faster, the STEINHART Ocean One Vintage Dual Time PREMIUM also makes use of the highly domed sapphire crystal, which already enjoys big popularity as a feature of our Ocean One Vintage. 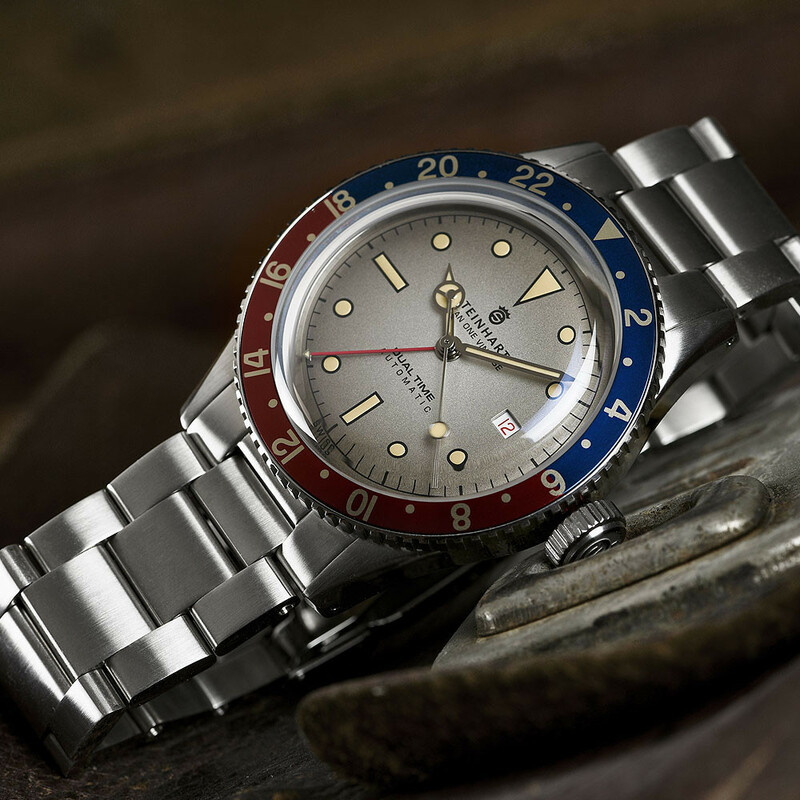 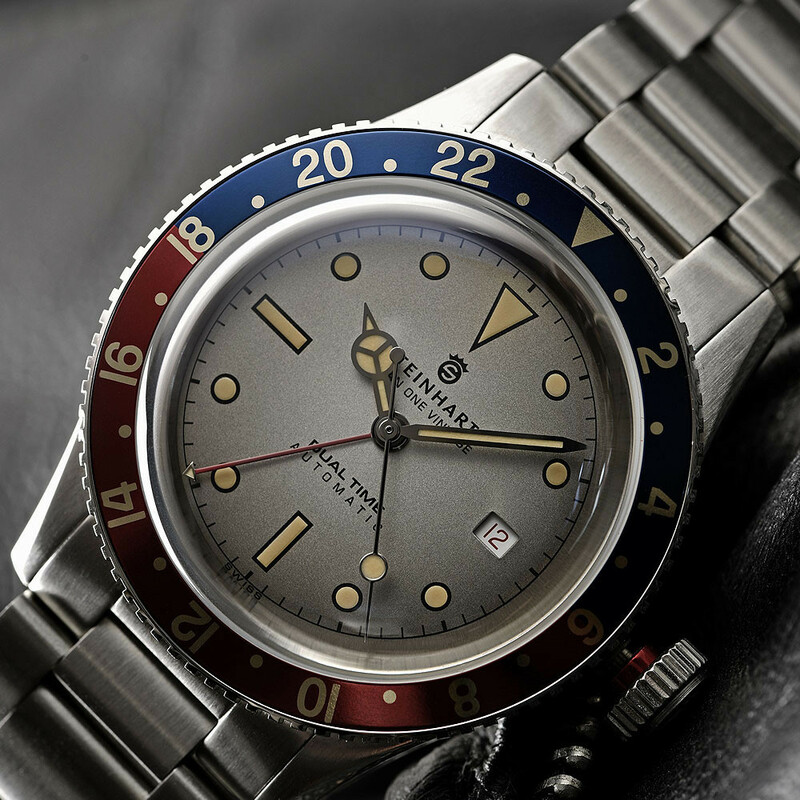 Whether one prefers it on the stainless steel bracelet or rather the padded leather strap, the STEINHART Ocean One Vintage Dual Time sure is a must for every wristwatch fan! 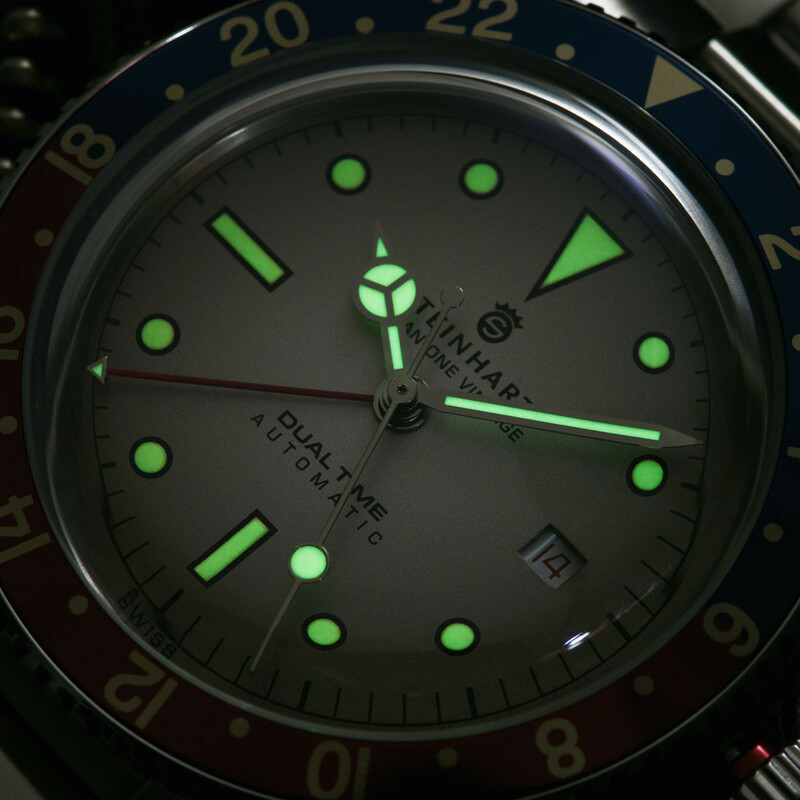 hour and minute with Superluminova Vintage " Old Radium "